Lightworkers, once they are awakened, devote most of their lives in bringing light into this world. The light they bring shines through their hearts. With just their presence and inherent spiritual abilities they alchemize the darkness of the world into true light. Despite their higher calling, lightworkers are not people who isolate themselves from the society and live in a cave. We can see them around as chefs, writers, singers, producers, cleaners, mothers or mediums. They can be famous gurus or even local bartenders that have a passion for dancing. Whether big or small, their contribution helps in raising the vibration of our planet. They do not do it through some special techniques or activistic global movements, but by just being themselves and letting their vibration transform everyone who they interact with. They subconsciously know that they are strategically placed like lighthouses in different parts of the world to feed people with positive vibes. Every time they’re faced with difficulties, they often bounce back with more strength and more positive outlook. They fully know that obstacles are just tools that trigger their true light to come out and shine brighter into the world where it’s needed the most. But lightworkers are humans too who have their own vulnerabilities and inner flaws. These inner ‘monsters’ are essential in helping them become the highest version of themselves that shines with the brightest true light. These challenges are the inner blocks that each lightworkers has to face and overcome in order to transform into their ultimate selves. The lightworkers’ journey is not the easiest of all. On the contrary, it’s a journey fettered with loss, sadness, illness, depression, anxiety, fear, and constant struggle. This may seem cruel, but it’s the only way for lightworkers to let go of the layers of themselves that don’t serve them. In all subtlety, they’re being nudged to look within until they understand that nothing matters except who they really are. The moment they remember who they truly are is the moment their light starts to shine. In short, lightworkers are flame carriers who need to find the light of their flames and the essence from where it comes from. It’s the flame carrier’s duty to illuminate the world. Only that in coming to the physical world and modern society, lightworkers have difficulty managing their flame within being looked at as if there is something wrong with them. Most of the time people do not understand them and the intensity of their emotions and this can result in the dimming or extinguishment of their light, and their fire becoming destructive anger. The first ‘monster’ they have to face is their own fire. They need to embrace it and accept it as something positive and constructive. They need to realize it’s their power not their weakness. They need to look beyond it and see the true light it has the potential to illuminate the world with. Lightworkers are natural healers. However, they need to heal themselves first before they can go out into the world and teach people how to heal, or heal them with their presence. When a lightworker’s inward journey of looking for their true essence begins, it signals the start of an arduous adventure of facing their own shadows and inner demons. They need to go through this painful process of self discovery until they’re able to reignite their flame once again through their real essence. The calling may be unique for each one, but all lightworkers follow the same life theme of being lost once in their lives and finding themselves again. That’s how they can face the shadows within their psyche that hold the orbs of their essence. The second ‘monster’ they have to face are these shadows that are scattered parts of themselves they turned their back on because they assumed were unacceptable for society. But only by acknowledging these parts, accepting them, embracing them and giving them love, they can become whole and shine with their true light. At this stage, some lightworkers may have already been doing their soul’s purpose. But, others may still be unable to figure out what their purpose exactly is. These are the people who don’t yet know how to fully utilize their true light and need the inspiration from fellow lightworkers to remember their own. There are many things that might hold someone’s purpose hidden. The environment may be holding these lightworkers back. Old habits, negative friends, limiting beliefs and assumptions about what they should do can be the building blocks of their prison cell. Once they break free from what holds them back, they can burst into flames they’re not even aware they have. The third ‘monster’ they have to face is exactly this inner prison they have built for themselves by living in a fabricated society ruled by fear. Once they realize what their chains are that hold their true purpose locked, they need to break them and start living their purpose. Even the smallest step towards their purpose is still a big step in the right direction. We need these awakened souls to bring their healing energies in our sick world. We need their words, their empathy, and their healing hand. 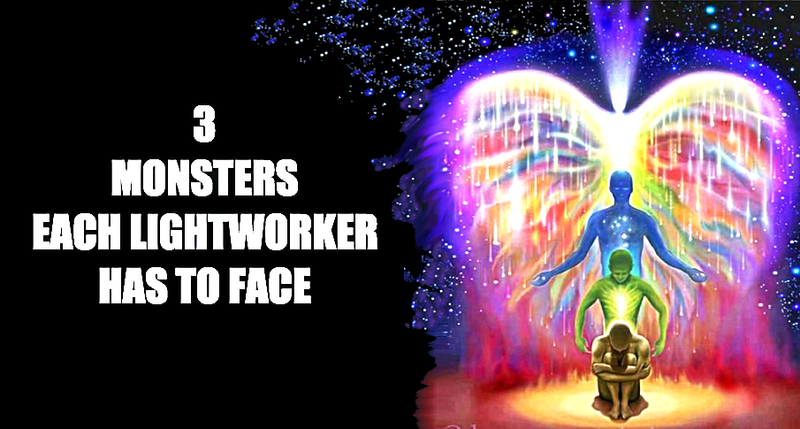 We need these lightworkers. Do You Want To Become A Superhuman? Reprogram your paradigm, Debug limits, Update to your full potential, Hack into better life, Merge duality to single script, Activate humanity, PLAY!